Stanton Oaks Tenant Association, a member organization of Housing Justice League, held a rally on January 24 that was successful in getting the owners of their apartment complex to promise to re-install the tenants’ security doors within two weeks, after brushing aside tenants’ concerns for months. The owners of the complex, the Woda Group Inc., removed the metal security doors from every unit’s front door before a HUD REAC inspection back in October without any warning or explanation, causing a threat to residents’ safety. At the time of their removal, the Woda Group promised to replace the doors in a timely manner. But after taking the time to go through the different chains of command, writing letters, and meeting with local and corporate management, the Woda Group suddenly informed Stanton Oaks Tenant Association that they would not get their doors back. “As tenants we have a right to live in a safe space and after months of waiting for the Woda Group to take our concerns seriously we decided to organize a rally in front of the complex office in hopes to have the issue addressed. Many of us are living in fear every day,” said the tenant association’s president and long term tenant, Sherise Brown. 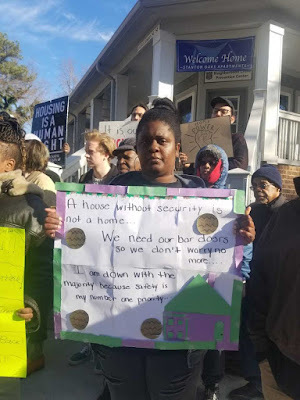 At the rally, tenants expressed deep concern about their community’s safety without their security doors and tried to bring awareness to their situation. Jacqueline Lawrence talked about how the door of apartment next to hers had been kicked in. "It was just tore up and the door was just standing open," said Lawrence. "It didn't take any time. They were in there in about a minute." When Lawrence made a report of the incident to the apartment management, the management tried to place the blame on her asking why she hadn’t called the police, rather than recognizing the need for the doors’ re-installment. The Woda was able to get away with ignoring the concerns of the Stanton Oaks tenants for several months because property owners understand that tenants’ rights often go unenforced in a society that privileges the interests of management companies and property owners with wealth over those with lesser means. Uniting with other tenants however builds power to draw attention to problems and get them resolved. There are many more tenants than landlords, and when it comes down to it, it is actually the landlords who are dependent on tenants for paying their rent. And with the rapid gentrification occurring in Atlanta and increasing profitability of luxury developments, it is more important than ever for tenants to protect their right to affordable housing. The Stanton Oaks Tenant Association’s rally was a demonstration of collective power and it got undeniable and immediate results for tenants. 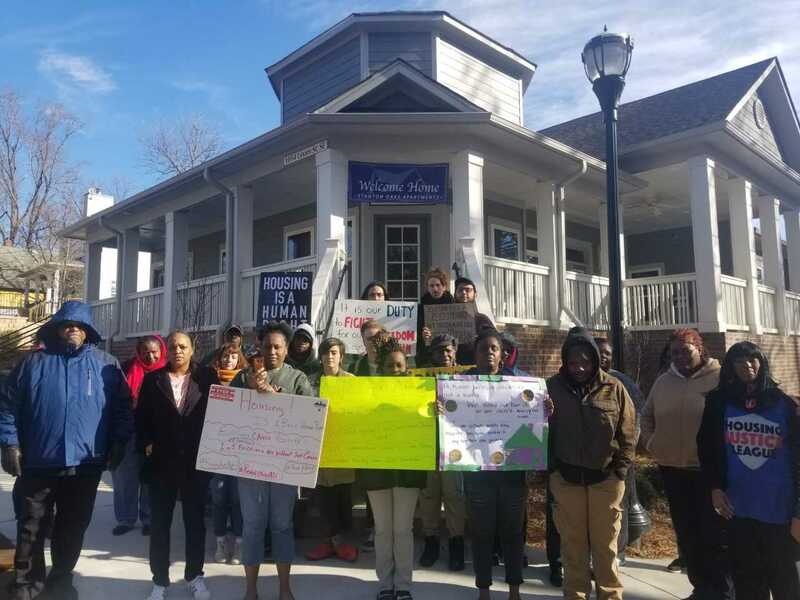 Housing Justice League stands with Stanton Oaks as they continue working to address the need for safer lighting around the complex and other issues. Watch local CBS coverage of the story.